The VirZoom VZ Sensor works with headsets to make sweating a little more fun. A $400 VR exercise bike might be a tough sell for VirZOOM, but the company has a new option that could make working out in virtual reality more compelling. At E3 2017, the company is showing off its new VZ Sensor, a small device that attaches to the crank of any stationary bike. For $99, you can turn a bike that you may already have into a VR workout center. If you're not familiar with the company, VirZOOM is a VR exercise company that wants to make breaking a sweat a little more fun with immersive games. There are seven options, including the road cycling and tanks demos I pedal-powered here at E3. 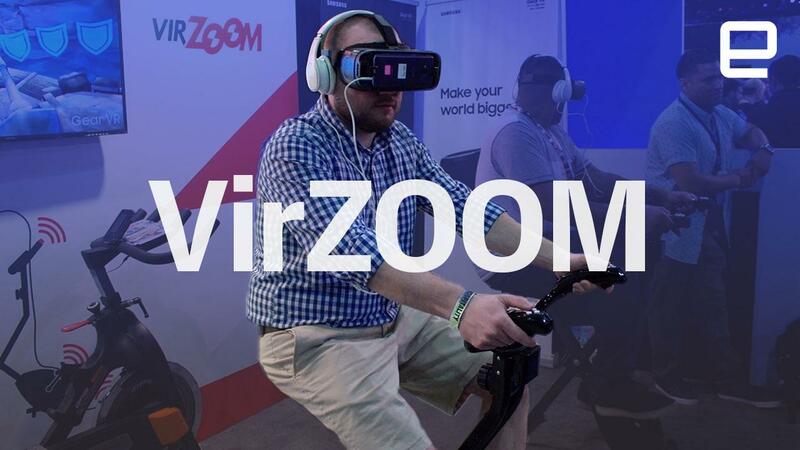 In addition to working with PlayStation VR, HTC Vive and Oculus Rift, VirZOOM announced compatibility with the Samsung Gear VR this week. And yes, it will soon work with Google Daydream. If you happen to also have a Samsung Gear smartwatch, the system will gather heart-rate info to keep tabs on your effort. The affordability of the VZ Sensor makes what VirZOOM is trying to do a lot more accessible to people looking to giving their workouts a gaming twist. The only downside is you have to hold a controller in your hand while you ride to play some of the games (the VZ bike has built-in controllers). Those tank canons aren't going to fire themselves, after all.